The Fatra mechanically fixed lap fastened system provides sustainability and cost efficiency due to the versatility of the system. The lap fastened system is generally quicker to install and reduces both material and labour cost depending on the application. The Fatra lap fastened system can be implemented on most areas from the basement to the roof. Depending on the application, area of use and Fatra wind load calculation reports provided by Fatra, the lap fastened system can be installed using either 1m wide rolls to remove the requirement of intimidate fixings through the field sheet which will reduce material and labor costs or 2m wide rolls which will reduce the amount of hot air fusion welding to the conjoining laps. All joints, laps and terminations are hot air fusion welded creating a permanent and physical bond and does not rely on adhesives, sealants or tapes to create a waterproofed joint. Consultation with a Fatra technical representative is advisable when looking to implement a lap fastened system. Fatra can provide guidance on design and implementation to best suit each individual project and achieve site specific objects. Full specifications are provided for all Fatra projects. 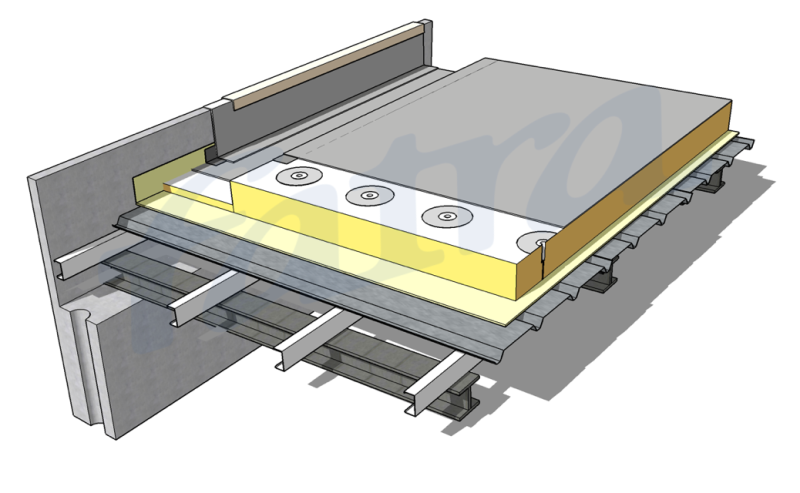 The Fatra insulated cool roof system has been specifically engineered by Fatra to create a non-penetrative mechanically fixed cool roof system. 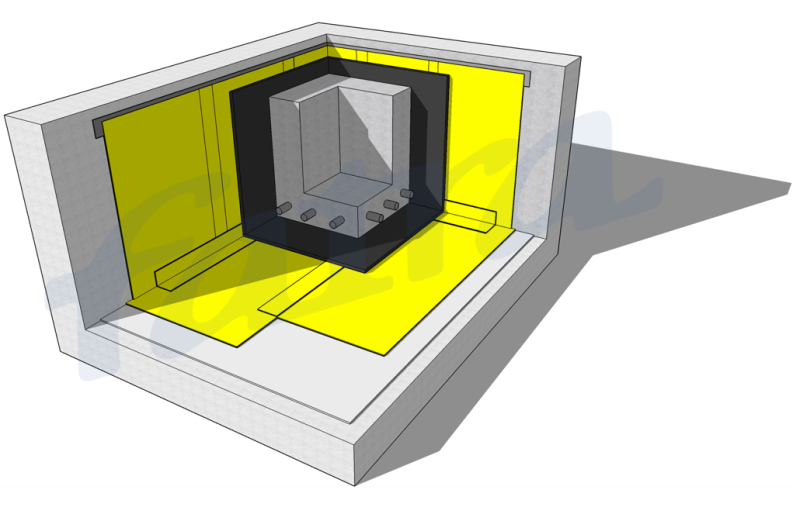 This system provides the client with superior thermal efficiency, reduced installation programmes, reduced material costs and can reduce air conditioning costs by up to 25% per annum and improve the overall thermal rating by up to 20% due to minimising the amount of thermal bridges when installing the insulation to the underside of the roof slab. All joints, laps and terminations are hot air fusion welded creating a permanent and physical bond and does not rely on adhesives sealants or tapes to create a waterproofed joint. Unlike traditional cool roof systems where the membrane is installed below the installation and then requiring a ballast to weight the insulation down, the Fatra cool roof system removes the requirement for the pebble ballast which completely obscures the membrane making any rectification extensive and very costly not to mention adding a substantial amount of additional and unnecessary weight to the structure itself. Fatra will provide a condensation report for all potential cool roof projects along with a wind load calculation report which dictates the fixing patterns available and a full specification outlining which build up will achieve your project objectives and provide the most sustainable and energy efficient waterproofed system. The Fatra structural steel deck system implements a structural steel deck fixed to purlins with a vapour control layer, FatraTherm insulation and Fatrafol 810v nylon reinforced PVC sheet membrane. Numerous steel decks are available to suit site specific requirements such as purlin spans & design loads. The structural steel deck built up system provides a far more sustainable and cost effective solution to traditional roofing systems. Where traditional insulated metal roof systems relies on sealants to the joints and rivets, the Fatrafol system is completely hot air fusion welded and does not rely on sealants to protect the roof from water ingress. Fully integrated PVC coated box gutters can be incorporated into the system to create a complete roofing system. 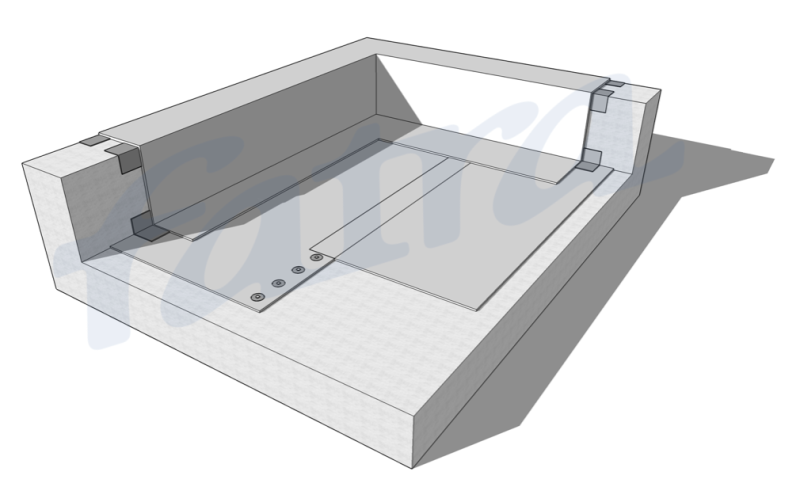 Unlike traditional box gutters which are riveted and sealed using silicon or polyurethane, the Fatra box gutters are jointed and strapped with PVC membrane which is designed to withstand the structural movement of the gutters without premature failures at the joints, stop ends and rainwater outlets. The Fatra new build & refurbishment system provides a fully adhered system which is bonded directly to various substrates using the Fatrabond moisture curing polyurethane adhesive. The Fatrafol 807v PVC sheet membrane is unaffected by substrate moisture and inclement weather conditions during installation, unlike liquid applied membranes which can delaminate & defect prematurely. All joints, laps and terminations are hot air fusion welded creating a permanent and physical bond and does not rely on adhesives sealants or tapes to create a waterproofed joint. The fully adhered system improves drainage to the rainwater outlets, improved aesthetics due to not being exposed to certain amount of wind flutter and also reduces disruption to the client. The Fatra PVC membrane bitumen refurbishment system gives the client an option to remediate or refurbish the existing failed bitumen membrane without having to pay extensive removal costs. The Fatra PVC Membrane bitumen refurbishment system is fully adhered directly over the existing bitumen membrane using the Fatrabond moisture curing polyurethane adhesive. All joints, laps and terminations are hot air fusion welded creating a permanent and physical bond and does not rely on adhesives sealants or tapes to create a waterproofed joint. Taking away the requirement to remove the existing bitumen membrane not only reduces cost and programming it also reduces the risk of the structure being exposed during the removal process which could result in water ingress should there be inclement weather during the removal process. Fatra understand that access and loading of materials can be quite difficult when working in live environments which is why the Fatrafol 807 is manufactured in smaller rolls to make the membrane easy to handle. 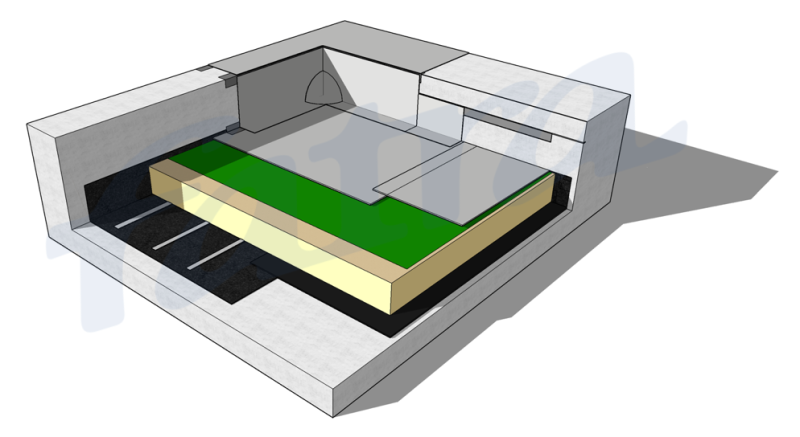 The FatraPVC Membrane fully adhered insulated cool roof system is a non-penetrative fully adhered cool roof system. 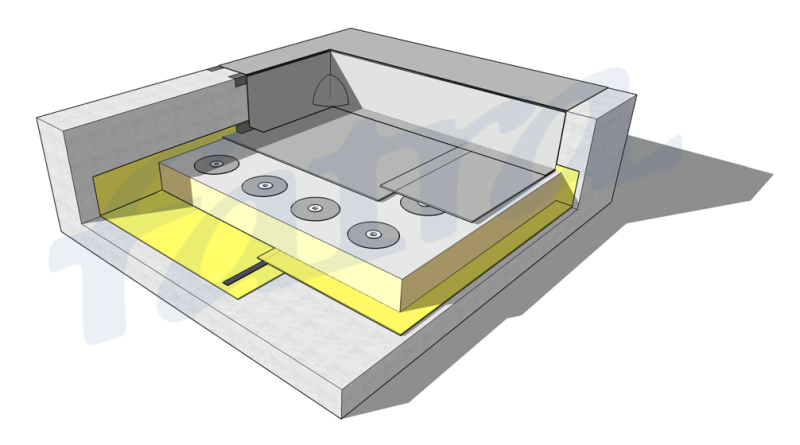 This system provides the client with superior thermal efficiency, reduced installation programmes, reduced material costs and can reduce air conditioning costs by up to 25% per annum and improve the overall thermal rating by up to 20% due to minimising the amount of thermal bridges when installing the insulation to the underside of the roof slab. All joints, laps and terminations are hot air fusion welded creating a permanent and physical bond and does not rely on adhesives sealants or tapes to create a waterproofed joint. Implementing the FatraPar vapour control layer, tissue faced insulation and the Fatrafol 807v fleece back membrane it minimises the number of fixings required to complete the system making it the perfect solution for live environment projects. Due to the system not requiring fixings to secure the system into place, the fully adhered cool roof system can reduce install times onsite and labour install costs. The fully adhered cool roof system also gives the client the opportunity to improve the overall thermal value of the building and create a standing seam replicate system giving the roof the aesthetics of a metal roof. 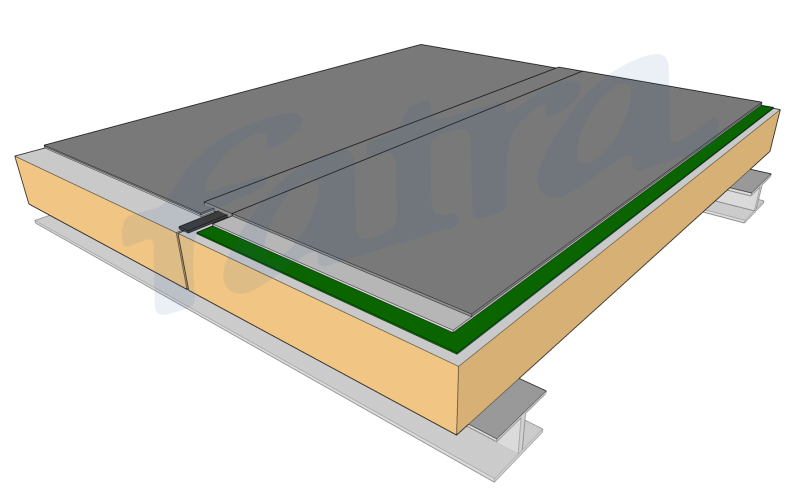 The Fatra PVC Membrane insulated roof panel system provides a fully adhered system which is bonded directly to a steel lined roof panel using the Fatrabond moisture curing polyurethane adhesive. Unlike liquid applied membranes, the Fatrafol 807v is unaffected by substrate moisture and inclement weather conditions during installation which can cause the membrane to delaminate & defect prematurely. All joints, laps and terminations are hot air fusion welded creating a permanent and physical bond and does not rely on adhesives sealants or tapes to create a waterproofed joint. The Fatrafol PVC Membrane fully adhered system improves drainage to the rainwater outlets, improved aesthetics due to not being exposed to certain amount of wind flutter and also reduces disruption to the client. The Fatrafol PVC Membrane fully adhered system provides the client with a number of overlaying finishes such as screed and tiles, synthetic grass, ballasted using timber decking, adjustable chairs and pavers and creating a standing seam replicate roof which gives the aesthetics of metal roof with the performance of a PVC membrane and a cost effective twist. With roof panels being exposed to excessive structural movement the Fatrafol PVC membrane has the ability to move with the panels without causing the membrane to shear and tear causing premature failures and water ingress. 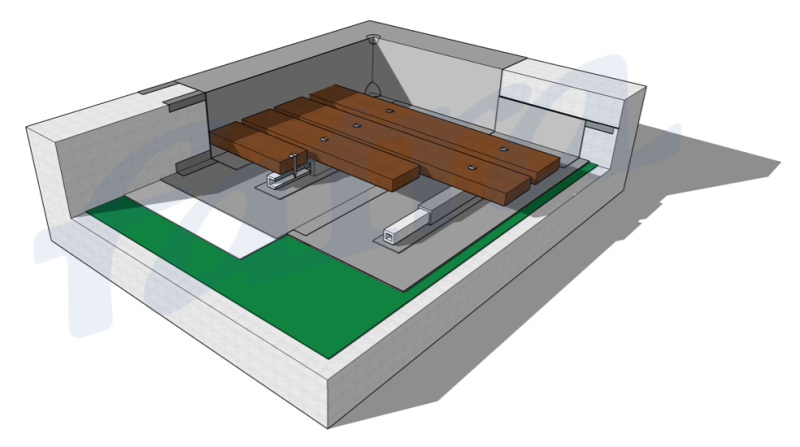 The Fatra PVC Membrane ballasted system can be implemented with a number of different types of ballast. Pebbles, adjustable chairs and pavers or floating decks can be used to ballast the PVC membrane system into place. Depending on site specific requirements and objectives the membrane can be loose laid, mechanically fixed or even fully adhered making this type of system extremely versatile. Implementing a ballasted system can reduce cost depending on the method of application whilst providing protection to the PVC membrane from the harsh UV which will in turn increase the life expectancy of the PVC membrane. 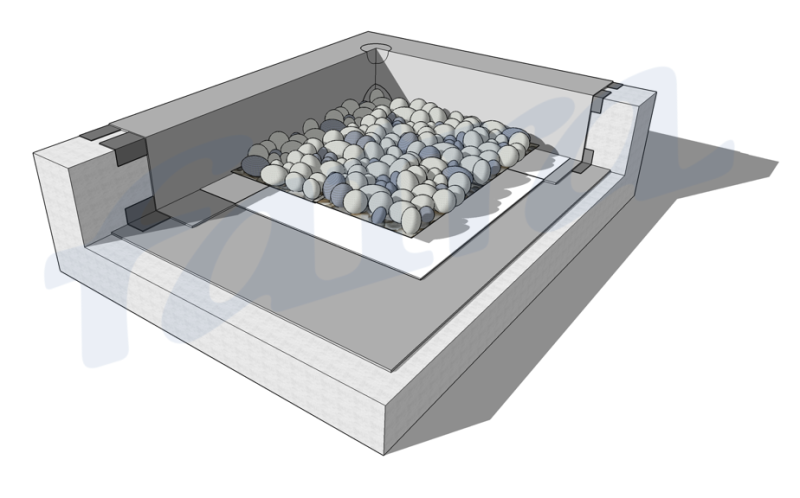 By implementing a ballasted system it covers the PVC membrane and can provide a very aesthetically pleasing finish to the specific area. The Fatra PVC Membrane timber deck system incorporates the FatraFix bar which is hot air fusion welded to the field sheet membrane providing the perfect solution to fix timber decking into place without puncturing the membrane and creating extensive detailing of penetrations. The Fatrafix bar can also be used to anchor mechanical plant such as air conditioning units, solar panels and the like subject to site specific engineering carried out by Fatra. The Fatrafix bars are installed with the fall of the roof, balcony or relevant area to ensure the drainage of rainwater to the rainwater outlets is not impeded. Consultation with a Fatra technical sales representative is advised when looking to implement the Fatrafix bar to ensure all aspects of the engineering and practically is considered and designed in to the project to achieve the optimum results. 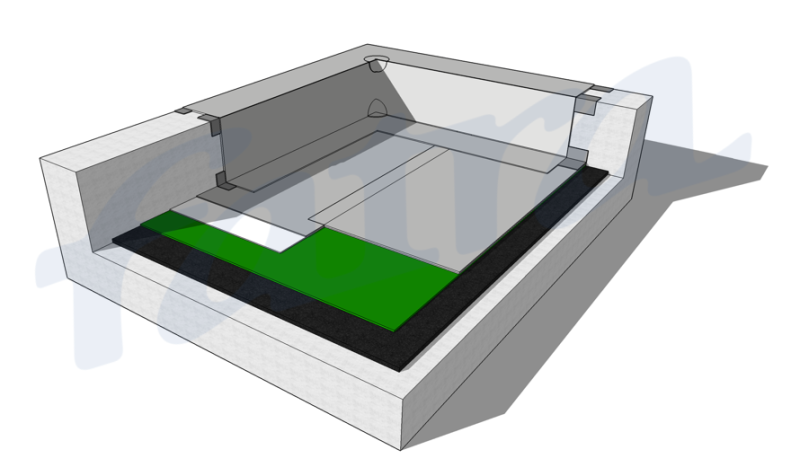 The Fatra PVC Membrane planter box and green roof systems incorporates the relevant protection layer, drainage cell, filter fabric and vegetation layers. The specifications for the different layers will depend on the clients objectives and requirements. 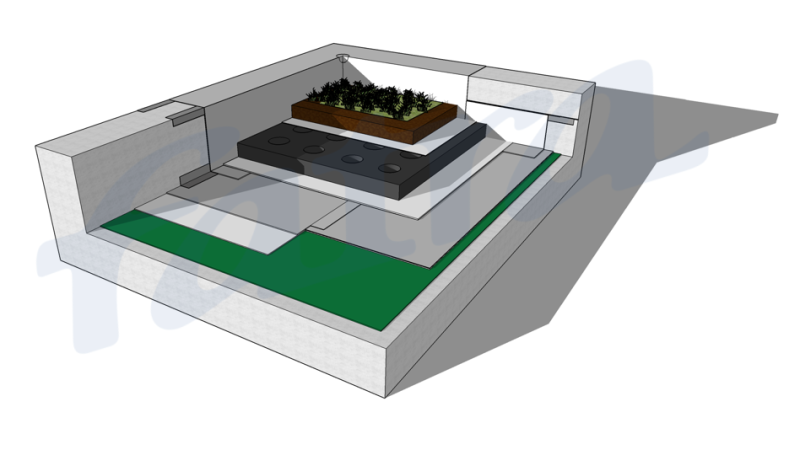 Fatra provide all components for the planter box and green roof projects making it simple and convenient for our approved applicators. The Fatrafol PVC membranes are tested to FLL standards and are proven to withstand root penetration from the most aggressive roots such as birch & oak trees. No additional protection layers or root resistant coatings are required like traditional bitumen and liquid membranes. Fatrafol membranes are 100% recyclable at the end of its service life and can be made using up to 30% recycled materials, Fatrafol PVC membranes are the most sustainable and environmentally friendly waterproofing membranes on the market today. 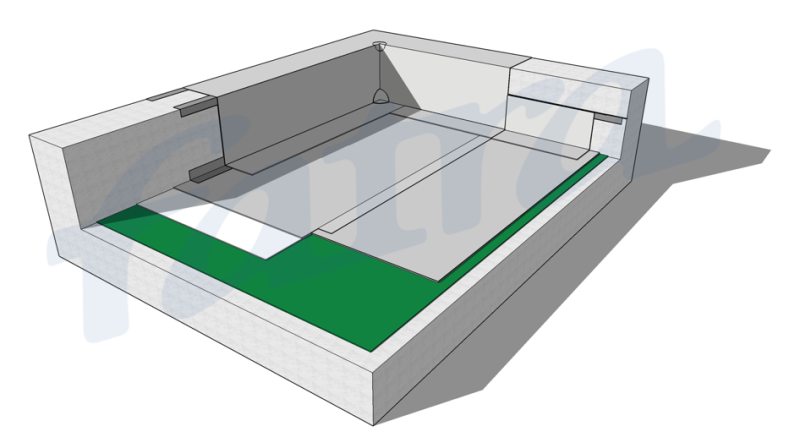 The Fatra PVC Membrane basement system provides our clients with a cost effective and versatile waterproofing solution for their basements, tunnels, retaining walls and other below ground areas. The Fatrafol 803 has been designed to withstand aggressive pressure and seeping water and creates a radon barrier. It is also made with a black scrim and yellow top layer to enable applicators to easily identify any punctures in the membrane. Once the yellow top layer is breached the black scrim shows through making any defects easy to spot and patch repair prior to laying the concrete slab or any overlaying finishes. The Fatrafol 803 is resistant to aggressive water pressure and creates a radon barrier to prevent the natural gases that are generated below ground entering the foundations. The Fatrafol basement system is completely hot air fusion welded which doesn’t rely on tapes or sealants to prevent water ingress. The membrane can be mechanically fixed or bonded using the relevant Fatrabond contact adhesive and can be installed over almost any substrate, pile walls, lift pits and the like with minimal preparation and does not require any priming to enable the system to operate efficiently.